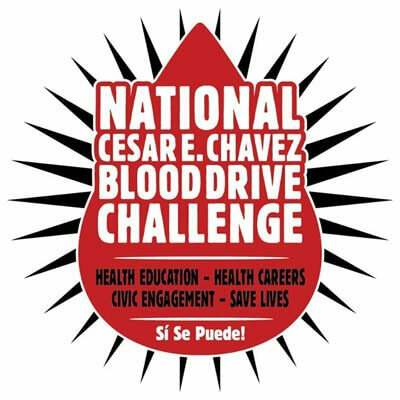 NIU will participate Wednesday, March 23, in the largest health service learning initiative in the nation: the National Cesar E. Chavez Blood Drive Challenge. Founded in 2009 with initially 42 college campuses, more than 300 campuses and 100,000 college students have participated since then. The Latino Resource Center, the Asian American Center, the Center for Black Studies and the Gender & Sexuality Resource Center have partnered with Heartland Blood Centers to bring the drive to NIU. Heartland will award a scholarship depending on how many units are drawn; NIU’s goal is 80 units. Blood draws will take place from 2 to 6 p.m. in the main classroom of the Latino Resource Center, 515 Garden Ave. Each donor will receive a free T-shirt. To schedule a donation, call the Latino Resource Center at (815) 753-1986 or call or text Camille from Heartland at (847) 305-9998 with a name and desired time. For more information, call (815) 753-1986 or email lrc@niu.edu.